Indian Air Force posted out the IAF Group X Y Airmen Admit Card 2019 on 27th February 2019 in order to conduct the examination on 14th to 17th March 2019. So, the IAF inviting the aspirants to check and download this Indian Air Force Group X Y Airmen Admit Card 2019/ 2020 Batch from the main site airmenselection.cdac.in fastly as possible. 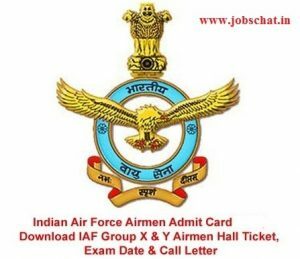 IAF Group X Y Airmen Admit Card 2019 Out ! Indian Air Force announced the IAF Group X Y Airmen Admit Card is announced And Exam Dates of 2019/ 2020 Batch to conduct the Written Test on 14th to 17th March 2019. Indian Air Force announced the IAF Group X Y Airmen Admit Card & Exam schedule for Airmen is Scheduled. So, the applicants who appeared and qualified ones must check this IAF Airmen Group X And Y Admit Card which is announced in 27th February 2019 as the exam is fixed on 14th to 17th March 2019. for the applicants to take the entry as an Airmen in IAF. So, it is the best chance for the applicants to take this examination to settle in Defence sector that too in IAF Jobs. So, all the applicants should complete the preparation using the Syllabus which is updated here. So, aspirants after receiving this must check and clear the query if any mistakes are printed on it. Otherwise, it may lead to problems in further rounds. So, the link activated is given below to check the Indian Air Force Airmen Hall Ticket. Check Indian Air Force X and Y Airmen Exam Date which is on the Admit Card in order to find their allotted. And there is no postponement of the exam date once issued. So, the aspirants must prepare well and perform well in the examination. The IAF won’t issue the TA to the aspirants. Based on this Exam Results, the aspirants will be called for the Interview and PET and PST rounds. So, the applicants must give the better performance to qualify for this jobs. Further info will be announced shortly. So, the applicants must stay tuned to this portal Jobschat. On the Homepage, find the Airmen tab available at the top or news tab available. Open it and among the list find the IAF Group X Y Airmen Hall Ticket 2019 and Enter the Reg ID No and Password/ DOB. Shortly the IAF Group X Y Airmen Call Letter appear on the monitor. So, the aspirants can attend the examination with this call letter.